Using a bench press chart is an excellent way to estimate your one rep max bench press. The table below will help you measure your progress against your goals to get stronger and build muscle. Using a chart is a great way to find your maximum bench press without risking injury during a maximum lift. The chart below uses the number of reps and the weight you lifted to determine your bench press one rep max and is an excellent alternative when you do not have access to a bench press calculator. Move to the right to the column the coincides to the number repetitions performed. For example, say that you lifted 95 pounds for 6 repetitions. You would find 95 pounds on the left side of the chart, and count over 6 columns. 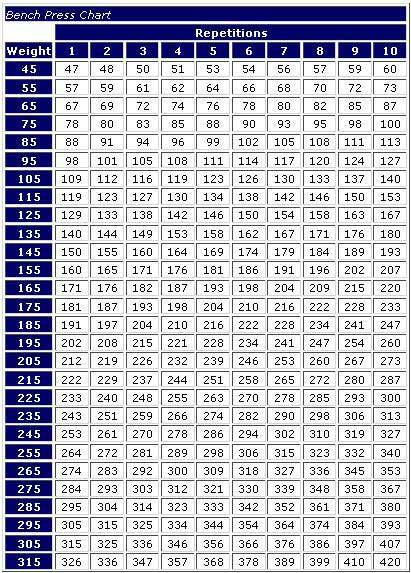 The chart says that your one rep max bench press is approximately 114 pounds. One of the best things about the bench press chart above is that it is a relatively accurate estimate of your one rep max for the majority of your lifts. This can help you determine the appropriate amount of weight to use in any of the workout plans found on this site.